After trying out the Fame MS 58, I decided to buy and test the Fame MS 57 Mk II, its obvious partner in crime. The Fame is very obviously trying to look as much like a Shure SM57 as it can. On DV247s web site, a Shure SM57 is currently £87.10 (£1 less than an SM58), and the Fame is £20.16 (£2.96 more than the Fame MS 58). The prices exclude postage, and they will come from Germany). So here's the Fame MS 57 Mk II, along with its supplied Shure-alike clip (again with no 5/8" to 3/8" adapter). At 146g, It's a very light mic. The Shure SM757 is a much heftier 284g. In comparison to the SM57's rotating plastic grille, the Fame's one is fixed. Whilst the Fame MS 58 is slightly larger than the SM58, the Fame MS 57 is almost exactly the same size as an SM57 (using Shure's data sheet measurements as I didn't have an SM 57 handy). Unscrewing the body showed again no transformer, unlike an SM57. Releasing the XLR connector again showed that the mic was wired for unbalanced use. This time, pin 3 wasn't connected to pin 1, so is safe for use with phantom power. The XLR locating screw tab was correctly linked to pin 1. When plugged in, there was no obvious noise from the mic. A test with a multimeter showed around 1 ohm resistance from pin 1 to the body, the coating of which is conductive. A test with a 'pup' sound showed that as wired, the signal went negative for a positive increase in pressure. 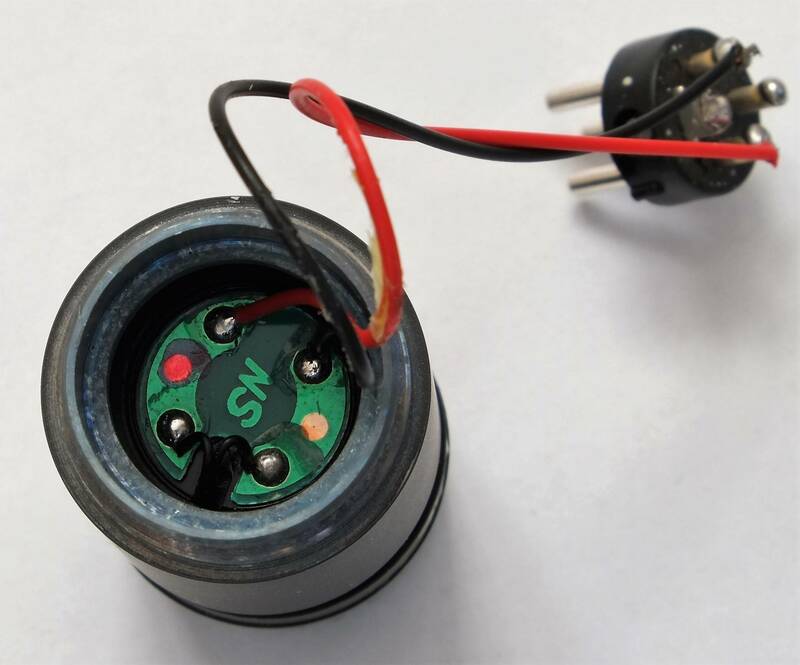 Whilst in theory, the same capsule should be used for both the MS 57 and the MS 58 (if truly based on the Shure mics), the circuit boards at the end of each of them were different, so it seems unlikely that the same capsule is used as in the Fame MS 58. The soldering iron then came out and the red wire was moved to pin 2. When plugged in, this was again tested with a 'pup' noise, which then gave a positive increase in signal for a positive increase in pressure. The signal output was approximately 6dB hotter than before, as could be expected. Handling noise was reasonable, with less high frequency component to it then with the Fame MS 58. 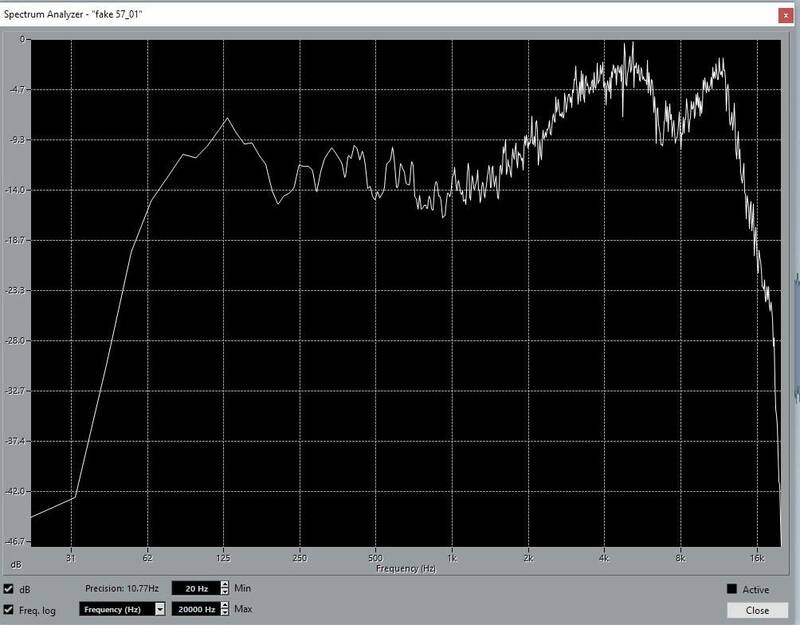 The top end boost appears to be greater than on a real SM57, especially when compared to the 1kHz value, by about 4dB or so, rather like the Fame MS 58, and again like it, the high frequency response seems extended by 2kHz or so, up to roughly 16kHz. 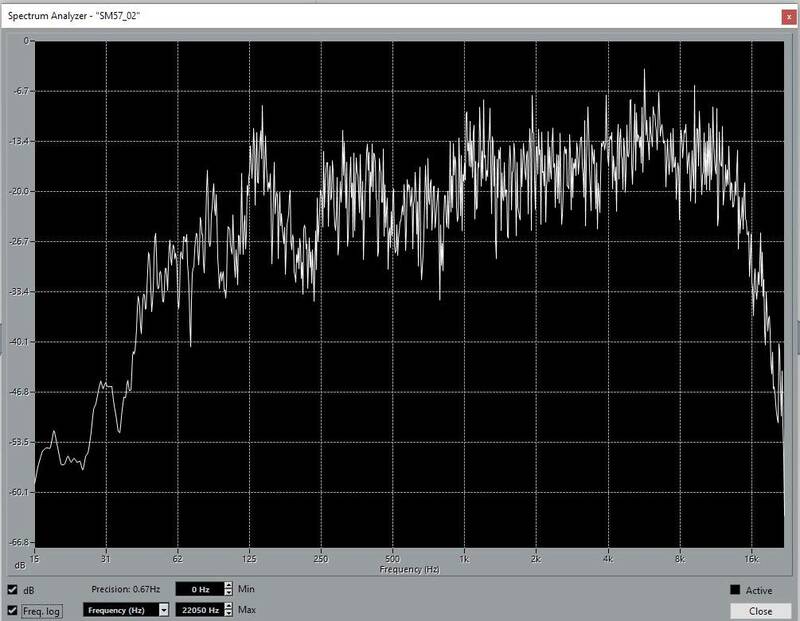 The high-end frequency dip that appears between roughly 7kHz and 9kHz on the Shure chart, appears around 2kHz lower with the Fame MS 57, between 5kHz and 7kHz. So it's certainly not a near-identical SM57 copy. So how does it sound in its own right? A quick listen to my voice showed a similar quite bright sound to the Fame MS 58, prone to highlighting sibilance. But as this is sold by Music Store Pro as an instrument mic, I thought I'd stick it in front of an amp along with a couple of other mics for a comparison. 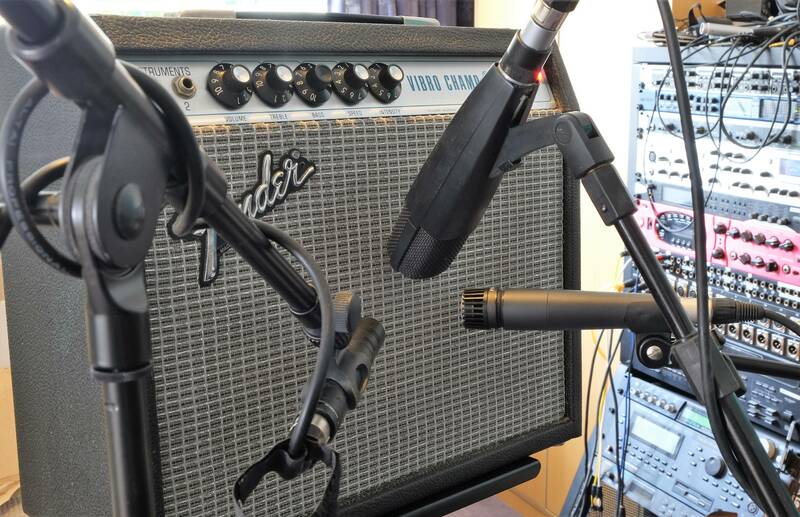 For convenience I stuck a 1982 Fender Vibro Champ on a stand, and miked it up with the MS 57 and without an SM57 to hand, I also used a Beyerdynamic M201 TG and a Sennheiser MD 421-U-5. All the mics were pointed at the cone at roughly a 45° angle, almost touching the amp and at a similar distance from the centre of the cone (the positions were fine tuned after I took the photo). When setting the input gains on the A/I. to get similar recording levels from the three amps, the Fame MS 57 had the quietest signal, the M201 was about 3dB hotter and the MD421 about 6dB hotter than the Fame. So I plugged in a Fender Strat and this is the result. No processing on the files apart from cleaning up the start and finish and normalising to -6dBFS. The uploaded files are 16-bit waves, so you can download them into your DAW if it makes it easier for you to compare them. 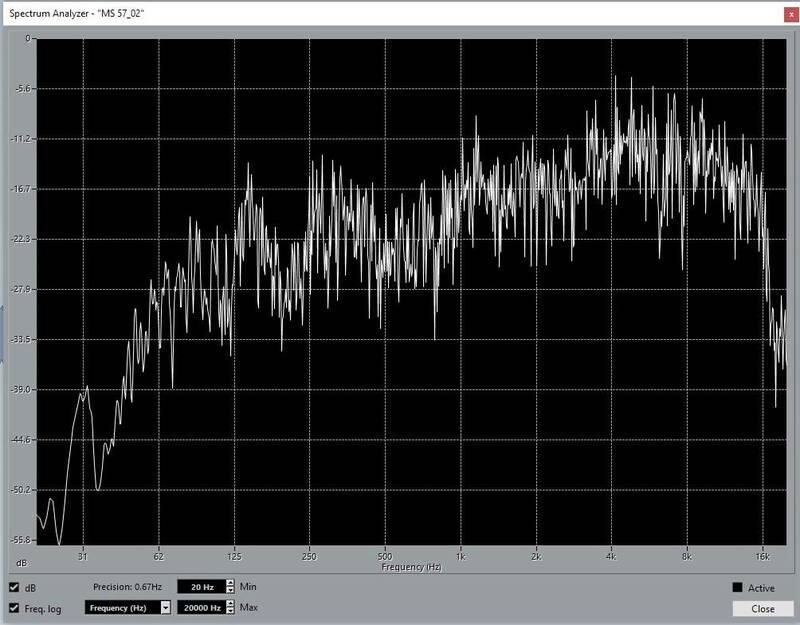 As there's not a lot coming off a guitar amp speaker above 6kHz (though the Vibro Champ has an 8" speaker so probably has a bit more HF output than a 12" speaker has), the boosted high-end of the Fame MS 57 is less likely to have much effect in this usage. However, the MD421 seems a little brighter than the Fame to me. And for live use, having a bit of a brighter top-end can often be an advantage (with the downside being an increased chance of high-end feedback). Overall, I quite like this mic, especially for the price and more so than the Fame MS 58. Yes, it needs modifying to make it balanced to get the best from it. No, it may look like a Shure SM57 but it isn't one. But it has a useable sound and there are some instances where the brighter top-end may come in useful e.g. on a snare where it will pick up a bit more of the high-hat if you haven't got a dedicated hi-hat mic. There are other times where it's just going to be too bright. For live use it's a reasonable, cheap, instrument mic. It's a It's certainly far better than the fake Shure SM57s to be found on eBay for a similar price. Wonks wrote: This time, pin 3 wasn't connected to pin 1, so is safe for use with phantom power. You'll have +48V on pin 2, forcing current through the coil to ground on pin 1. 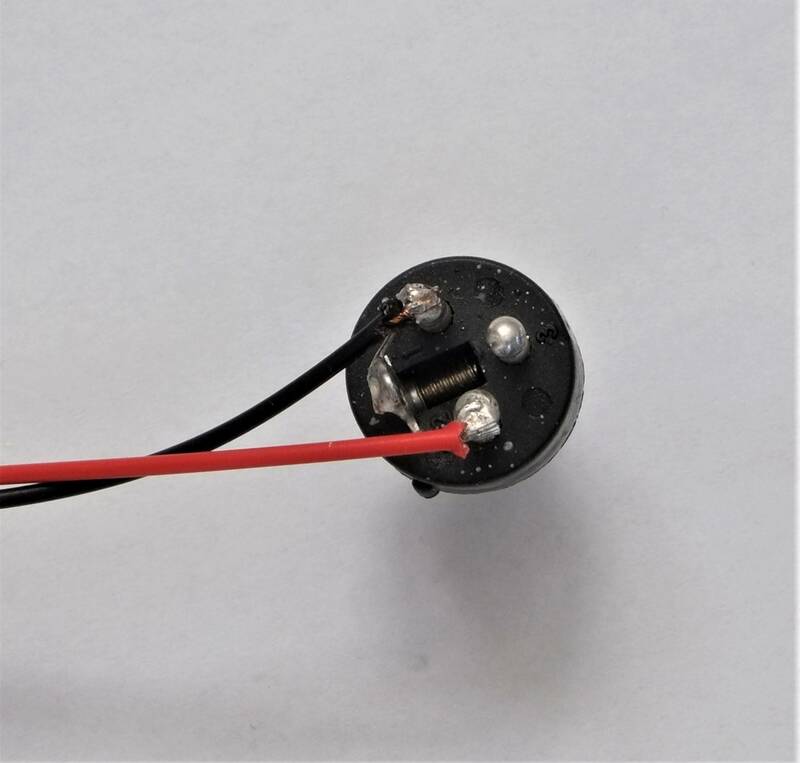 With DC across the coil from a phantom supply the capsule will try to act like a solonoid, extending the diaphragm to its furthest extent and substantially decreasing the mic's sensitivity and LF response. The coil is likely to become magnetised and it will then cease to work properly whether phantom power is switched on or not! 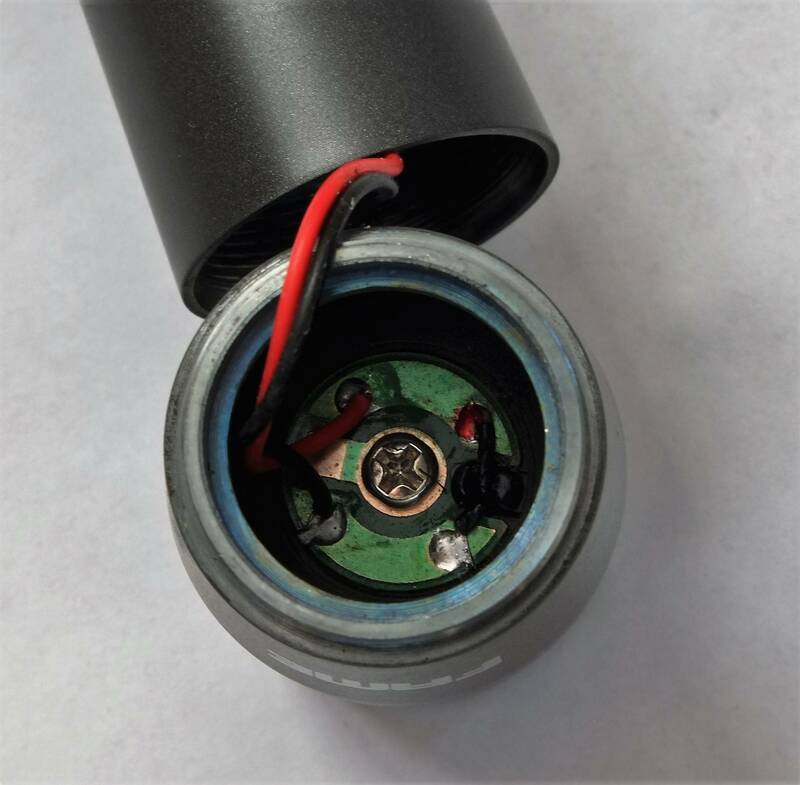 A moving coil capsule is only phantom-safe if the two ends of the voicecoil are wired to pins 2 and 3, with no connection at all (apart from the mic's bodywork) to pin 1. That way the coil has 48V at both ends and no net DC current can flow through it. I had a cheap mic I bought from Maplin years ago which wasn't wired for balanced operation, to which I accidentally applied phantom power. Killed it completely. Which wasn't such a bad thing as it forced me to go and buy something better! Following an afternoon spent with Dave B, who brought over an SM57 and some other mics, I'm going to have to downgrade my opinion of the Fame MS 57 considerably. Whilst not vastly different, the SM57 exhibits a stronger mid-range than the Fame, albeit slightly more peaky. The higher levels of treble on the Fame push its mids much lower in the overall sound. 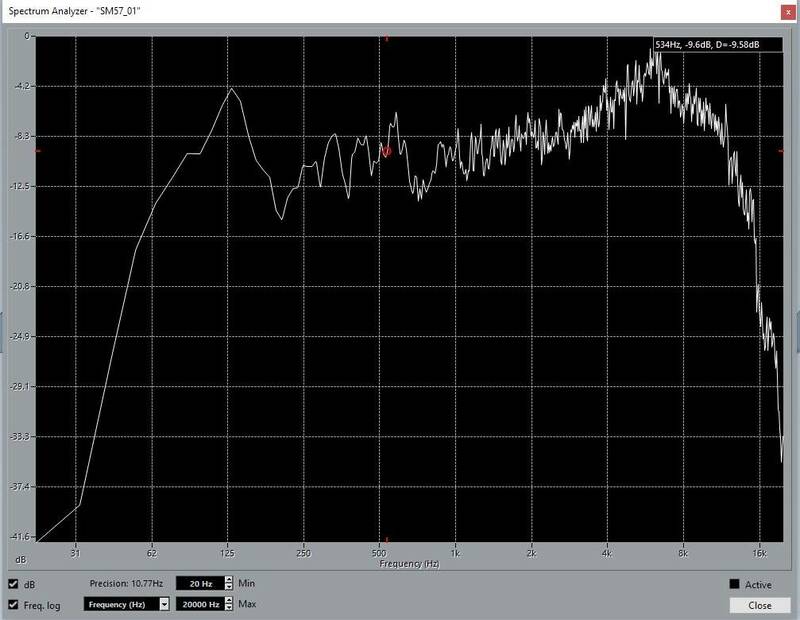 The SM57 doesn’t have the dip in response that the Fame MS 57 shows between 5kHz and 7kHz. Overall, the effect is to make the Fame sound more ‘scooped’ than the Shure. Interestingly the Fame’s output signal was about 4dB stronger than that of the Shure. This reinforces my opinion that the capsules in the Fame MS 57 and MS 58 are different, as the output of the Fame MS 58 and the Shure SM58 were almost identical. The SM57's proximity boost varied far less with distance than did the Fame. The bass roll-off on the SM57 as the mic was moved further away from the mouth was far less noticeable than with the Fame MS 57. With the Fame, compared to when it was right up against the mouth, the sound when 3” away was of a very different tonality with almost no bass and quite thin sounding. With the Shure, the bass end had dropped a little, but the tonality was very similar. Both mics rely on proximity boost to fill out their low-end response, but the SM57 doesn’t have to be kept anything like as close to the source, which really limits the items that the Fame MS 57 can be used to mic up. It certainly couldn’t be used as a podium mic, like SM57s often are. 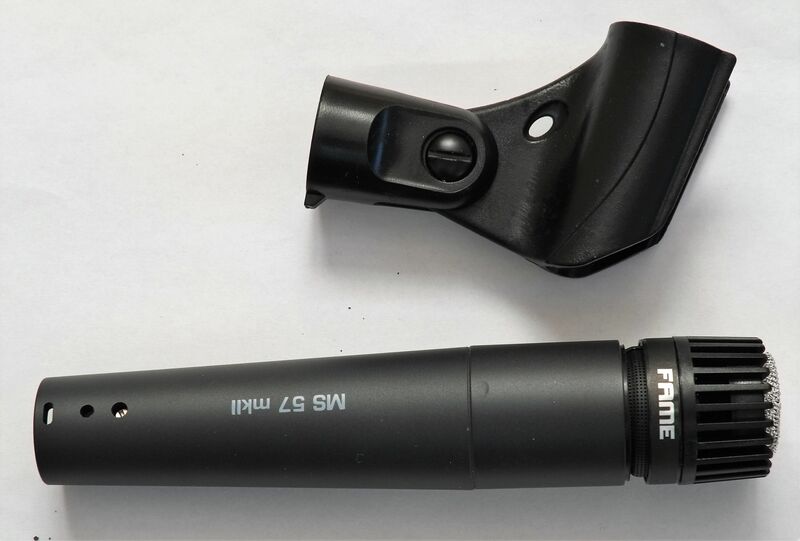 Compared to the SM57, the Fame had a lot more handling noise, both from the cable and the casing. The SM57 handling noise wasn't that noticeable at all, but the Fame's certainly was. Both mics suffered from plosives with the mics right up by the mouth, but the Shure less so than the Fame. The Shure didn’t have to be moved away from the mouth far to stop this being an issue, whilst the Fame had to be moved back by around 9” to stop any popping problems, but at this distance the Fame’s overall sound was very thin. The bass and mids have fallen off a lot further on the Fame than the Shure, again highlighting that the Fame isn’t a mic for placing away from the sound source, so couldn’t be used for miking up say an acoustic guitar, whilst an SM57 could. We then got the Fender Vibro Champ out again and compared the mics on that. The mics were first angled at 45° pointed at the dome and positioned slightly away from the grille cloth. With a clean sound, both mics sounded good. The Fame was slightly brighter than the Shure, as was to be expected, but not overly so. The Champ is a small amp with an 8” speaker, so on an overall less bright sounding 12” speaker, the extra brightness of the Fame might be of some benefit. However, when the amp was turned up to 10 (all 5W of it) and the Strat changed for a Les Paul with P90s for extra overdrive, the Shure still sounded nice whilst the extra treble of the Fame made things sound quite fizzy and far less pleasant. Moving the mics so they were pointing directly at the edge of the cone smoothed things slightly, but the Fame was again overly bright, picking up all those extra high frequency harmonics caused by the distortion. Mixing the recordings of the two mics, with some of the Fame sound mixed in with the SM57 resulted in a sound that was probably closest to what we heard in the room. We then conducted a very crude feedback rejection test, turning up the monitors with the mic pointed away from them and then rotating the mic towards them. The Fame MS 57 could be rotated by approximately 100° before feedback kicked in, which was high pitched (as could be expected from the HF lift of the mic). The SM57 could be pointed almost directly at the monitor before feedback ensued, and the monitor volume raised significantly before the SM57 fed back at a similar angle to the Fame. 1) Has an extremely pronounced proximity effect which falls away very quickly with distance compared to the Shure SM57. 2) Has a less balanced sound compared to the SM57, with less mids and more treble. 3) Is more susceptible to plosives than the SM57. 4) Is more susceptible to feedback than the SM57. 5) Has a lot more handling noise than the SM57. 6) Has to be modified to make its output balanced and happy to work with phantom power present. The Fame MS 57 Mk II may look like an SM57, but is really a very different microphone. It needs to be modified before it’s safe to use if there’s any phantom power around. Because of the handling noise, it needs to be kept stand mounted. To get a solid sound from it, it can only be used very close to a sound source, so guitar cabs and maybe on a snare. It can’t be used on any moving sound source as the tonality will change drastically with even small movements of the source. Yes, it’s a quarter of the current price of an SM57, but it’s also a less than quarter of the mic the SM57 is. Save up and buy an SM57 instead. For half the money of an SM57 I'd consider the AKG P4 . We also tested Dave's fake Chinese 'Shure SM57' mic that he bought (but never paid for because it was a fake) from eBay a few years ago. Apart from the different typeface for some of the writing, this looked and felt more like an SM 57 than the fame. It had a big block of epoxy in the body where the transformer on an SM57 goes, only there is no transformer, the (very) tin wires run straight through. The plastic grille rotates when twisted , though on the SM57 it's just the cap that rotates, the capsule stays stationary. On the fake, the entire capsule rotated as well, though the capsule + grille assembly stayed fixed in the top part of the body. This rotation had pulled the wires off the capsule terminals, so they had to be re-soldered. And yes, it was wired for unbalanced operation, with pins 1 and 2 being connected but nothing on pin 3. SO like the Fame, it came as unsuitable for use with phantom power. Unlike the Fame, it was not possible to remove the XLR insert to rewire it, despite screwing in the XLR locating screw fully. Either the construction of the mic (there appeared to be an inner metal insert inside the outer shell) prevented the XLR from being pulled out of the end of the mic, or else the epoxy held the wires in too tight a grip, but even quite severe tugging on the pins with pliers couldn't shift it. Plugged in, the microphone gave a strong output - a lot stronger than the SM57 despite the unbalanced operation - but the polarity was reversed from the norm. However it was not an output that was pleasant to listen to at all, being extremely nasal and harsh sounding. 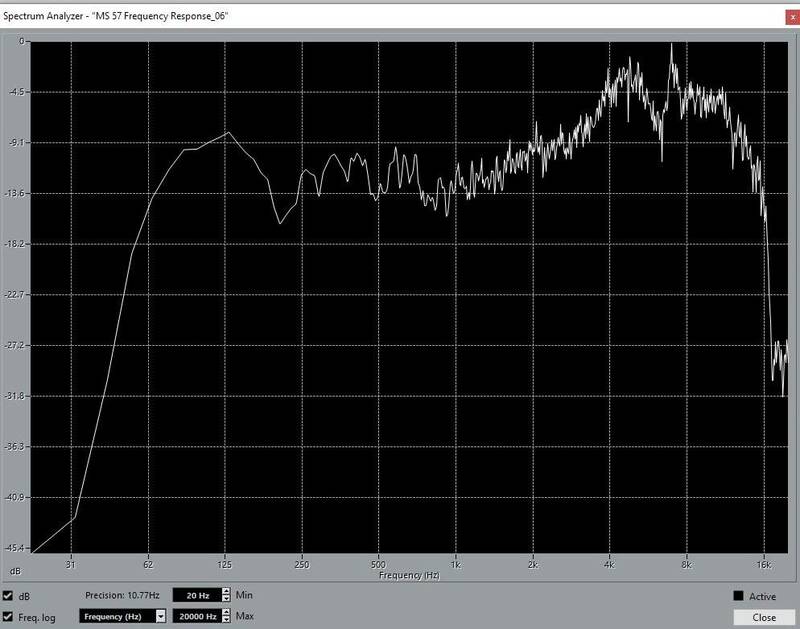 The treble lift is a massive 14dB or so above the normal 1kHz reference point, with two distinct peaks at around 5kHz and 11kHz with a 6dB or so dip between those. It sounded bad on voice, bad on clean guitar and absolutely awful on distorted guitar. So no redeeming features at all. There are still a lot of fake SM57s and 58s out there in eBay land, these days more used than new, so do be very careful buying used 57s and 58s. Unless I was buying from someone I knew and trusted, I'd always buy SM57s and SM58s new.